AKITA Factory | OKAYA SEIKEN Co.,Ltd. Akita factory is responsible for development of more new processing technology by leading the local area with precision processing technology with the local excellent human resources and is also responsible for processing technology transfer as the mother factory of the Vietnam Factory. 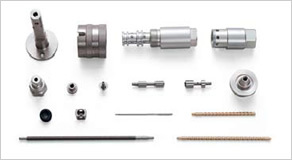 It provides integrated manufacturing from advanced cutting processing with NC automatic lathe to grinding processing. Also actively works on business expansion for development of the local community and activation of local industries.